I first "met" my friend Rob Jordan online over 10 years ago on the Happytown listserv, for fans of the singer-songwriter Jill Sobule. We met in several times in real life at Jill's concerts, and have kept in touch through email, MySpace (remember Myspace?) and now over Facebook. Over the past few years, I've read, with increasing anger and frustration, about Rob's health problems and the way he has been treated by government after his long, honorable service in the US Military. It makes me furious and ashamed. I want every single person who was so proud to put one of those yellow ribbon "Support the Troops" magnets or stickers on their cars back in 2003-2004 to read this and start thinking about what supporting the troops REALLY means. Because it's not about waving flags and putting bumper stickers on your car when we go to war. That's not support. That's typical wartime jingoism. What matters, what really counts, is supporting our people when they come home suffering the physical and mental consequences of their service. I'm talking to you, Congress. 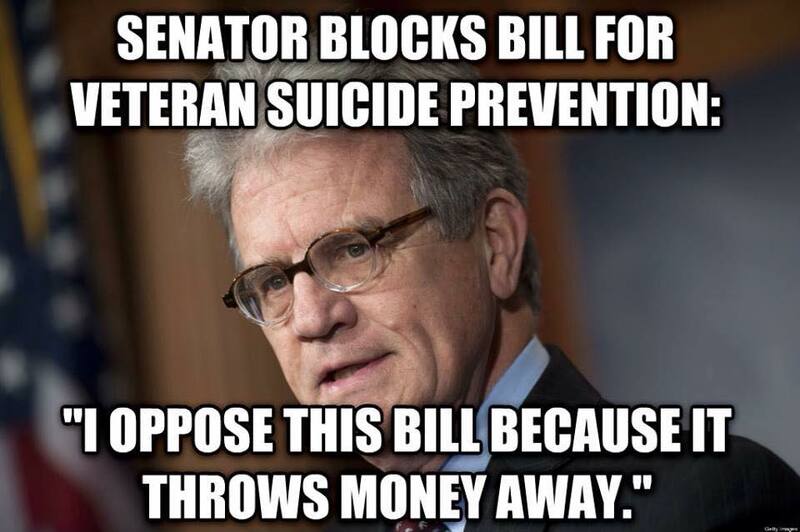 I'm talking to you, Senator Tom Coburn, (R-OK) who voted to send troops to war, but yesterday blocked the Clay Hunt Suicide Prevention Bill in the Senate. But don't listen to me. I'm just a writer. Listen to Rob. And please, get as angry as I am and contact your Congressman and Senators. I sometimes think that maybe I share too much of my personal life on this site. Possibly, but I am essentially alone, have no family nearby , and sometimes I just feel the need to share my thoughts. Thankfully I have a lot of family and friends here. Many of you go back to the days even before memory started to function. I have been having an internal argument lately and I very recently made a decision that I know that some of you will think is crazy. Please do not argue as it is my decision alone to make. Feel free to save any disagreements that you may feel obligated to voice until such time as you are in a similar situation and have this decision to make on your own.Many of you are well aware of the issues that I have been dealing with for the last 3.5 years. In 2011 I returned home from a deployment to Afghanistan with a rather impressive list of medical issues which were not in existence prior to this time. Since that time the problems have worsened and spread to other areas. An Air Quality Report that was conducted in the area I was stationed showed that the air we were breathing contained an extreme amount of contaminants due to the use of a very large “burn pit” on base. When cross referencing the identified contaminants with the effects of them on humans I found that all of the problems I had been dealing with could be traced to inhalation of these chemicals. In addition burn pit health problems were just starting to be publicized in the media. I have a fairly extensive collection of these documents if anyone should have any interest in them. For 3.5 years now I have been attempting to get the government to admit to at least a degree of culpability in this issue. As a matter of fact when I was finally able to present this info to an Air Force Doctor instead of the empathy and direction that I was expecting I was met with derision and scorn. It was obvious that the assumption was that I was in some way trying to take advantage of the system. In February of this year I was approached by a personnel representative with an idea. I was told that with my health issues I would be able to get a disability retirement through the Federal Government. I took this individuals advice and submitted the application. I even signed resignation paperwork to be submitted upon approval of my application.After a seven month wait I was notified that my application was disapproved. However, my resignation paperwork had already been submitted. As a result me health insurance was cancelled. Coincidentally I was scheduled for a heart procedure the following week. This had to be cancelled since I was no longer insured. I appealed the decision but was notified last month that the appeal was also disapproved. So I find myself unemployed and uninsured as a result of trusting someone within the system. Of course this has made me extremely leery of accepting any more advice. I am afraid that with the next decision I could end up homeless. I have run up against all types of personalities while dealing with this issue. Our system is made up of gatekeepers, those who do their best to prevent anyone from achieving benefits lest someone obtain something they are not entitled to. Empire builders who will sacrifice an individuals livelihood rather than admit that they made a mistake and run the risk of appearing less than perfect. And the politicians that will smile to your face and reassure you while siding with the system because, well, it’s just easier that way.After 32 years it has been an extremely jarring reality check. If I could give advice to anyone new in the system, or in almost any career actually, it would be this. Do not live for your job. Make sure that you devote at least as much effort into family, community, or other fulfilling interests. The system does not care about you as an individual. Remember, the promotions, medals, awards, and other recognition are not given because leadership cares about you as an individual. They are given to recognize what the system has gotten from you. When you are no longer able to contribute, you will probably just be cast aside. Within the last month or so I have developed some new health issues that have me actually worried for the first time. I have started losing my balance at completely random times while walking. For this reason I usually carry a cane with me to add stability when needed. At least when pride permits. The issue that is bothering me the most is that I have begun experiencing short spells of confusion. There are times when my mind seems to empty out and I could not even tell you my name. These are the primary reasons that after 3.5 years of this ordeal being at the forefront in my life, after pushing as hard as I could yet still falling backwards, I will fight no more.I believe that it is safe to assume that I will not be living to a ripe old age. I do not want the time that I have left to be taken over by something that just makes me bitter and angry. There are many great people in my life and many things that I enjoy doing. I want to put all of this negative crap out of my head and concentrate on living a life that I enjoy with the people that are important to me. I know that there are many that will say, “But that means that the system won!” To this I say, “No, I won. I am living a life where their lies and hypocrisy don’t matter“. The system is being run by heartless assholes and idiots. I don’t give a single good goddamn whether they win or lose. Remember how the government didn't want to admit that contaminants at Ground Zero had anything to do with the respiratory ailments and cancers that first responders and pit workers suffered? It wasn't until massive political pressure was put on them that the Zadroga Act was finally passed in 2010 (it's up for reauthorization next year - make sure you encourage your Congresspeople to vote in favor). Congress is rightly perceived by a majority of Americans as being completely dysfunctional. The only way we can get them to do the right thing is by massive political pressure. Please. Contact your reps. Make noise. Do it for Rob, and for all other other vets who answered the call when asked, but are now being treated so horrendously by the nation they served.